When Porgy and Bess opens tonight at McCaw Hall, there will be an unusual instrument in the orchestra pit--a twangy tenor banjo, which accompanies Porgy (Gordon Hawkins) in the song "I Got Plenty o' Nuttin." John Lowrie (left), noted Seattle actor, singer, composer, novelist, instrumentalist, banjo-player, and guitar repairman, tells us a little about performing the banjo part--and about the instrument he's playing, which was originally owned by a member of the band that commissioned Gershwin to write "Rhapsody in Blue." Can you tell me about your musical and artistic background? I started playing trombone when I was in 4th grade, picked up the guitar when I was in 7th grade, and then picked up the flute when I was in 10th grade. I went to Indiana University as a composer, and my principal instrument there was the trombone, because they didn’t have a guitar department. But by that time, I was already a professional guitarist and had played in a world fusion band that was made up of two acoustic guitars. Our duo had put out an album, and opened for people like Buddy Rich, back in the ‘80s. Then in the late ‘80s, I fell into acting. In 1989, my wife and I moved to Seattle and began making our living primarily as actors. (My wife is Ellen McLain, who has sung many comprimario roles with Seattle Opera in the past 20 years.) But I’ve had occasional music gigs since then, such as playing in the national tour of the Broadway show Mame, which has a big guitar and banjo part in it. I’ve also done some composing, and I’ve just written a novel that will be released on September 1. So, you’re a multi-instrumentalist who composes, acts, and writes? What is your upcoming novel about? It's called Dancing with Eternity and I'd describe it an absurdist fable, set 2000 years in the future. They’ve figured out how to keep everyone from dying, and the novel explores what that society, without death, is like. So, for example, if I murdered you, you’d have to go to the hospital, I’d pay for it, and you’d end up being fine. What’s your history with Seattle Opera? My involvement with the company began in the ‘90s, when Speight Jenkins decided to commission a satire of Wagner’s Ring cycle--Das Barbecü--and I was in the original cast. I played Wotan and Gunther and Hagen and a bunch of other characters, because there were only five people in the cast. At the time, my wife was also starting to develop a relationship with Seattle Opera; she performed Silver Dollar in The Ballad of Baby Doe (1991/92), Kate Pinkerton in Madama Butterfly (1994/95), Flora in La traviata (1996/97), and a few others. And then I decided to work on my voice and take lessons and audition for the Seattle Opera Chorus (my wife and I have always been involved in musical theater). So I was in the chorus for The Flying Dutchman and Aida. How did you begin playing the banjo? Well, while I was getting my Master’s at Indiana University, I had a reputation as a guitarist. So when they decided to do Show Boat in the opera department, they asked if I could play the guitar and banjo parts for it. I’d never played the banjo, but I learned how; once you know how to play guitar, it’s a pretty easy transition. It’s like learning Italian when you already know Spanish. The 5-string banjo has its own oddities because of its short string, but the 4-string tenor banjo is just like the top four strings of a guitar. It was originally tuned like a mandolin, which was tuned like a violin. 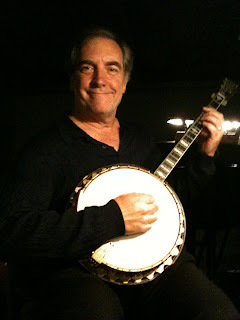 An interesting connection I just discovered today: My first professional gig playing banjo was a European tour of Show Boat, and the conductor of that tour was Bill Barkhymer, from whom Seattle Opera has rented the current Porgy and Bess set. You’ll be playing the tenor banjo in Porgy and Bess. What are some of the differences between this and the 5-string banjo? There are theories that the name “tenor banjo” is a mutation of “tango banjo,” because the 4-string banjo was developed in the 1890s when tango was taking the country by storm. These tango bands had brass in them, and mandolin players weren’t loud enough to play alongside them, so the 4-string was developed. Then when Dixieland and jazz came about in the 20th century, you had brass bands and guitars weren’t loud enough to keep up with that, but banjos were. So they tuned these tango banjos similar to guitars, and perhaps that where the name morphed into “tenor banjo.” But despite its current name, the tenor banjo is no higher in pitch than the 5-string. It just has one fewer string. Can you tell us about this particular banjo you’ll be using for Porgy and Bess? We hear it has an interesting back-story. I didn’t have a tenor banjo before this summer. What I’ve always done is remove the short string of my 5-string to play the tenor banjo, because they’re basically the same instrument. But for Porgy and Bess, I wanted to do it up right, so I was on the lookout for a proper tenor banjo. I play Sherlock Holmes on a radio series on KIXI 880 AM, and I was going in to record an episode when I happened to tell Jim French, a producer and writer for the show, that I would be playing banjo for Seattle Opera's Porgy and Bess. He told me that his wife’s father played banjo with Paul Whiteman’s band in the 1920s--Whiteman was actually the one who commissioned Gershwin to write "Rhapsody in Blue" in 1924--and although her father had passed away in 1981, they still had his banjo. I said, “Oh, great, would you mind showing it to me?” I had a feeling it would be a tenor banjo, and it was. It had been a memento for his wife of her father, so it had been on display in the living room and had been subjected to the kind of things that instruments are subjected to when they’re not stored in a case—like changes in humidity, for example. The binding had come off one side, and it was filled with dust because banjos have a billion cracks and crevices dust can get into. So I said, “Listen, if you can loan me this for the summer, I’ll fix it up for you.” Jim asked his wife and she began crying because she thought it was wonderful the banjo was going to come back to life, be given a job with Seattle Opera, and be given a voice again. I took it home, took it completely apart, cleaned every piece, glued the binding back on, scrubbed the frets, and cleaned it inside and out. I knew it was special when I saw it, but I did some research and found that it was a 1926 Vega No. 9 banjo, one of the finest banjos ever made. Also, because it was played on the vaudeville circuit with Paul Whiteman, it was all about pizzazz and show, so Pat’s father had put in two lightbulbs inside the banjo so the drum head would light up when he’d play! Now, it looks wonderful. The gold plating is a little worn, but it sounds great and looks great, and it’s a privilege to be able to play this old banjo. The fun thing for me is that this banjo was playing with Paul Whiteman at the same time Gershwin was working on Porgy and Bess. Are there any challenges in playing the banjo in Porgy and Bess? The one thing you need to work on a bit is tremolo, because the style of banjo you want for Porgy and Bess is a kind of rinky-dink sound, and you have to find that hand. Other than that, it’s not a particularly difficult part, and I’m just featured in one number (“I Got Plenty O’ Nuttin”). But it’s wonderful, and I think the banjo is the perfect instrument for this moment. I’ve always thought of the banjo being the essence of optimism. Here’s an instrument that African slaves in this country put together to keep themselves optimistic and alive through this hideous ordeal of slavery. For Porgy to be accompanied by the banjo, when he’s singing that he’s as poor as dirt but doesn’t care because he’s still happy, I think that’s amazing. Really interesting to hear about this banjo. Thanks! What a great interview, full of good information and humor. I've been a fan of John Lowrie and Ellen McLain for years, but I didn't know about half of John's talents and accomplishments. I look forward to hearing him on the banjo next Saturday.